Manchester City have had their noses pressed up against the glass while the Champions League festivities went on without them - despite the riches, they were all dressed up with nowhere to go. Europe's elite tournament has provided little other than disappointment as well as the mystifying failure of expensively assembled City teams to look anything but strangers in the competition. Sometimes just one moment, or in this case two in the space of five late and dramatic minutes, can provide the spark and self-belief to convince Manchester City and their fans that they actually belong in the Champions League. The two moments came from the world-class talent that is Sergio Aguero, pouncing on unlikely errors as 10-man Bayern Munich, cruising to a 2-1 win, were beaten 3-2. Suddenly the door is ajar for City as they travel to Roma for their final Group E game on 10 December. City can go through so long as they better CSKA Moscow's result against Bayern in Munich but if City lose to Roma, or it ends 0-0, they would go out. Can they reach the knockout stage for only the second time in four attempts? Is this the night the Champions League came alive for Man City? Not until the last five minutes perhaps - but when it did it could yet prove to be a huge turning point for City and Pellegrini. The Chilean effectively told his players at half-time that they had 45 minutes to save their involvement in this season's Champions League. True enough, but there was a lot more riding on it than that. After a last-16 exit to Barcelona last season amid rancour over the first-leg refereeing of Swedish official Jonas Eriksson, who Pellegrini claimed favoured the Catalans, this campaign has been dismal. No wins from four games before Tuesday, including a home draw with Roma and a 2-1 loss to CSKA Moscow, another defeat at Etihad Stadium against a Bayern side reduced to 10 men would have been a huge embarrassment for Pellegrini. Defeat would have seen City having to beat Roma by three goals, an unlikely scenario, with an exit damaging Pellegrini's reputation and posing further questions about whether he was the right man to take this fiercely ambitious, but also superbly run, club to the next stage of their development. Instead Aguero's hat-trick, aided by Bayern's carelessness, means City have finally caught the break they needed in the Champions League because this was a victory stolen from defeat after an aimless performance for the most part. Now they have the great opportunity in Rome. Manchester City captain Vincent Kompany said moments after Aguero's colossal match-winning performance: "If you want to succeed at anything you need to have a special player in special form." No prizes for guessing who the Belgian meant - come the crisis comes the man. And City's man is this squat, powerful, clinical 26-year-old Argentine. This was a night that had echoes of the never-to-be-forgotten day in May 2012 when Aguero drove into the QPR penalty and used his trusty right foot to win the Premier League title with almost the last kick of the season. This winning goal did not win a trophy - indeed it may yet lead to nothing - but it may yet be heavy in significance if it provides the foundations for progress for a club and squad desperate to prove they belong in the Champions League. The manner in which Aguero punished errors from Xabi Alonso and Jerome Boateng in the closing moments was the sign of a master at work. As Liverpool have found in reverse after the departure of Luis Suarez, the player who makes the difference is almost priceless and in Aguero, City have the perfect package. He is Suarez without the baggage and now belongs in that elite group comprising Lionel Messi, Cristiano Ronaldo and the brilliant, maverick Uruguayan. The stats do not lie. They merely confirm what a glorious talent City have. In 138 games for City he has scored 90 goals, including 14 in 22 Champions League games, as well as two in two Champions League qualifiers. In the Champions League this season he has scored five goals from seven shots on target and is only the second player to score a Champions League hat-trick against Bayern, following on from Roy Makaay for Deportivo La Coruna 12 years ago. 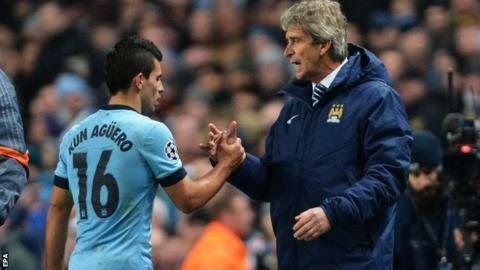 Aguero, who signed a new five-year contract in August, has stated he will not leave City until they win the Champions League. They will have a much better chance of winning it with him than without him. Can City now truly believe? Manchester City have beaten Bayern Munich before - 3-2 in the Allianz Arena last December - in a match best remembered for Pellegrini's apparent failure to realise another goal would have put them top of the group. This victory, however, may carry a wider importance because circumstance must surely give City the self-belief that they can cap a remarkable recovery and reach the last 16. City's lack of that belief has been a common thread throughout their Champions League struggles, with a talented and experienced group of players apparently unable to grasp the reality of how far and how fast the club had developed. Even City's supporters seem to struggle to embrace the Champions League, with games not completely sold out. Those inside Etihad Stadium went from despair at 85 minutes to elation at 90 - and the whole club may now allow itself to think the Champions League may just hold something for them other than frustration. To add to City's delight, it was a win achieved on the back of Aguero's brilliance but also without suspended midfield duo of Yaya Toure and Fernandinho, as well as injured creative force David Silva and striker Edin Dzeko. True, Bayern had injury problems of their own. Outstanding captain Philipp Lahm was missing, with those other World Cup winners Mario Gotze, Thomas Muller and Bastian Schweinsteiger starting on the bench. But City's resilience and ability to pull this win out of the bag can only bolster what at times (in the Champions League at least) has appeared to be brittle confidence. A glance at the quality in Pellegrini's squad says they are more than capable of winning in Rome, but what Manchester City are capable of and what they actually produce have been two different things for much of their life in the Champions League. Even in victory against Bayern Munich, they were short of ideas for much of the game and were hauled over the line by Aguero. The win was impressive but the overall performance was not, with Bayern keeper Manuel Neuer rarely troubled and Bayern, under the passing credo of coach Pep Guardiola, comfortable with reduced numbers. Bayern, even with 10 men, completed 563 passes to City's 403, but the scoreline says City won and the club that tells us to expect the unexpected had done it again. Pellegrini and his players will also surely study and take heart from Bayern's thorough pasting of Roma, winning 7-1 in the Stadio Olimpico in October. City may even believe the fates have finally dealt them a decent hand after CSKA's late equaliser against Roma in Russia worked hugely in their favour. Part of City's charm is that air of the unexpected - and they have been given a chance even they may not have expected. It is all up for grabs.